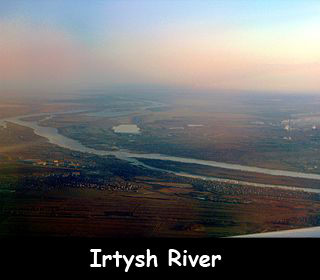 Irtysh River is one of the longest rivers in Asia with a length of 2,640 miles. It begins at the junction point of the Biya and Katun rivers, in the Altai Mountains, and then flows through Siberia to the Gulf of Ob. The Irtysh and the Ob River together make the world’s seventh longest river system. It forms a part of the polar freshwater habitat in the countries of Kazakhstan and Russia. The drainage basin of this river system covers most of Western Siberia. The Irtysh River is Ob River’s major tributary. Main tributaries of the Irtysh River include the Tobol River, Demyanka River and the Ishim River. This river was also the site of ancient civilizations of the Mongol and Turkic peoples. There are total of seven bridges spanning the Irtysh River. It is navigable for most of its course. The main river ports are Khanty-Mansiysk, Tobolsk, Tara, and Omsk in Russia and Pavlodar, Semey, and Oskemen in Kazakhstan. Along with Amur, Lena, Ob and Volga, Irtysh is one of the principal rivers in Russia. The Irtysh, Lena, and Ob River flow northward across Asian Russia into the Arctic Ocean. The combined Ob-Irtysh is so long that the land it drains incorporates many different ecosystems. It is an important route for the transportation of goods. Declan, Tobin. " All Facts for Kids about Irtysh River ." Easy Science for Kids, Apr 2019. Web. 23 Apr 2019. < https://easyscienceforkids.com/irtysh-river/ >.